Our Products >> SHOOTING AMMO, Single Cartridges, Packages & Boxes >> RIFLE Calibers, Boxes & Packages, CenterFire Shooting Ammo >> INCH Calibers, Rifle Boxes & Packages, Current & Obsolete >> .22 Hornet , Boxes, Shooting Ammo >> .22 Hornet, Newly Made, P/L, 45gr. JSP, One Box of 50. One Box of 50 Cartridges: .22 Hornet, newly made with “new brass”, cases with “PPU 22 Hornet” head-stamp and loaded with a 45 grain JSP (jacketed soft point) projectile. History of the .22 Hornet: The 22 Hornet was developed in the late 1920s by Colonial Townsend Whelen and Captain G.L. Wotkyns for the Springfield Armory, using the older 22 WCF (Winchester Center Fire) black powder cartridge, and the new (for the era) smokeless powders to achieve higher velocity. Winchester offered this caliber ammunition to the public in 1930. 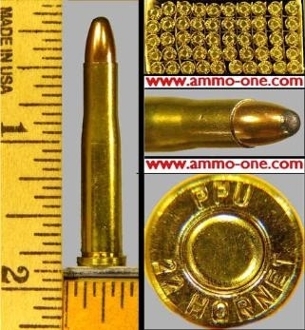 .22 Hornet, Newly Made, P/L, 45gr. JSP, One Box of 50.